In physics, effusion is the process in which individual molecules flow through a hole without collisions between molecules. Graham's Law: Rate of Effusion is inversely proportional to the square root of the molar mass. We can use Graham's Law to calculate the molar mass of an unknown gas via the relative rates of effusion. With this we can use the Ideal Gas Law to calculate various other things. 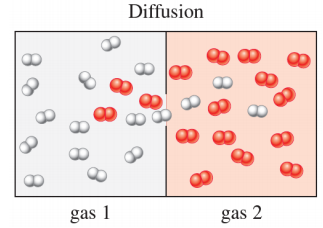 Diffusion is the movement of one gas through another.